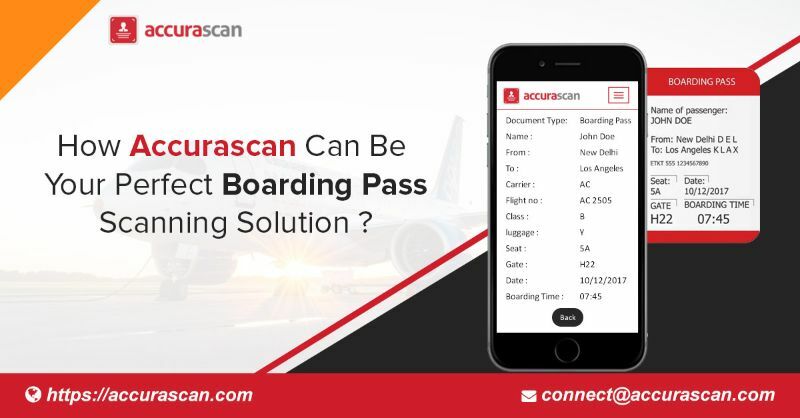 How Accurascan Can Be Your Perfect Boarding Pass Scanning Solution ? When you are a frequent flyer, you often experience flight delays and cancellations. In the worst scenario, as a flyer, you can also experience boarding denial which leads to a loss of your ticket fare. But with technological advance, there are now available an array of solutions to overcome this problem. Having a boarding pass scanner comes handy in such a situation, and the Accurascan app is one such perfect boarding pass scanning solution. The lightweight app developed by Accura Technolabs in Singapore is powered by the revolutionary OCR technology which gives it a distinct advantage to extract text details from the machine-readable zone of vital documents including a boarding pass. Thus, instead of getting just a digital copy from a traditional boarding pass scanner, Accurascan rendered accurate text extraction. As a flyer, it completely eliminates the need of manual entry of your flight details in a text file as such a course of action often leads to typing mistakes. Also, the boarding pass reader is of great benefit to the airline industry. Airport professionals can know whether a boarding pass is valid or not just with a tap on the screen with the Accurascan app installed on their mobile devices. They can do this verification at the boarding gate itself. More and more airports around the world are now using boarding pass readers as this saves a lot of valuable time. Airports no doubt have a good Wi-Fi connectivities, but having a reader that can read boarding passes in an offline mode proves a boon. More so if the reader can give the advantage of mobility to security personnel. Accurascan being a mobile app can be easily downloaded from the Google Play Store or the App Store. Thus, it is easily available for use by airport security officers irrespective of the fact that whether they have an Android smartphone or an Apple device. Accurascan has ample potential to become the perfect boarding pass scanning solution because it is entirely customizable. Developers at Accura Technolabs have also developed its SDK and web API that allow rapid customization of the app and its integration with other apps. This left ample scope for the airline industry to use it to scan other vital documents and saving the scanned information in their database. Meanwhile, the Accurascan app’s scanning capabilities are not just limited to boarding passes. It can also accurately and rapidly scan passports, ID cards, U.S driving licenses, as well as Pan card and Aadhar card (India).